Chinese Medicine is a wholistic system that looks at the lifestyle choices of a person – diet , emotional constitution, activity and stress levels– as well as which preventative measures can be taken to promote optimal health in the form of flowing Chi or life energy. It works by removing blockages to the flow of Chi throughout the body’s organs and systems along the meridians and acupoints. Traditional Chinese Medicine has three branches: Acupuncture, Herbal Medicine, and Chi K’ung. Acupuncture is the stimulation of acupoints with fine needles which are left in for up to an hour and are administered on the back body, front body, or both at different intervals. Points run along the 12 main meridians which run from head to toes, from the medial to the peripheral body. Meridians are like the ley lines of the body, and they influence the health and communication between the body’s many complex systems, internal organs, and nerves. Herbalism is an ancient science carefully arisen by thousands of years of study and exists in all the world’s cultures. The way of herbs is more gentle and assimilative for the body. Healing with herbs induces a restored connection with the earth and its’ mysteries, which satisfies a vital need for informing us of a sense of place in the natural world– and assists in the unfolding of the spiritual human energies. Chinese medicine makes use of many parts of plants, roots, mushrooms, and in some cases animal products as tonics, teas, and teapills. Another component of Herbalism in Acupuncture exists as moxibustion, which is the practice of using mugwort smoke to influence the circulation and prosperity of Chi while acupuncture needles are in, and is also relaxing and aromatherapeutic. 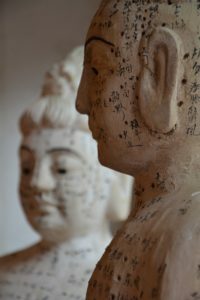 Acupuncture, acupressure massage, cupping, dietary/lifestyle counselling, exercises, and herbal remedies not limited to TCM but strongly influenced by its’ wisdom. Treatment plans are an extremely beneficial way to maintain self-care or to address acute issues. Plans can be designed with a commitment in place from the client for periods of 7 days, 10 days, 14 days, or one month. For more information on what treatment plans are available, please contact us to find out more.